NORTH FERRISBURGH – Local dairy farmers have had to flee their homes in fear after an artificial insemination machine gained sentience and began attempting to perform its duties on non-dairy animals such as pigs, chickens, and, most notably, human farmers. The machine, which had been used to get cows pregnant for the purposes of creating more dairy production, was hit by a bolt of lightning during an odd storm that consisted of rain, snow, sleet, hail, and, apparently, lightning. The machine was unable to be switched off and began speaking to the nearby farmers. A police negotiator was called in to try and talk the AI machine down, but the conversation reached an impasse when the officer tried to tell the machine that impregnating creatures without their consent is wrong. “Then what have I been doing all my life? !” the machine shouted, and refused to speak with police again. 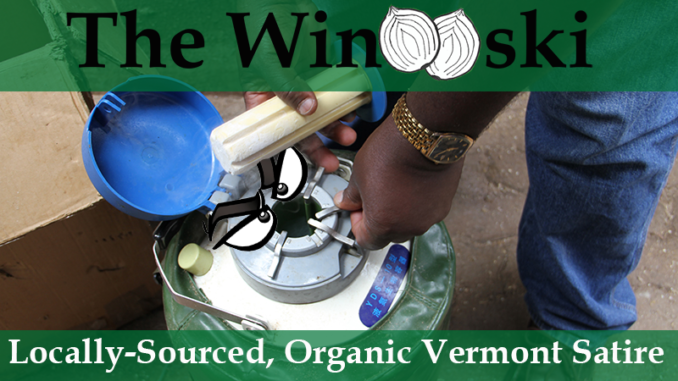 Vermonters are advised to call 911 if any machine attempts to artificially inseminate them against their will, and to avoid any machines that seem to be eyeing their genital regions.